Reference brains are indispensable tools in human brain mapping, enabling integration of multimodal data into an anatomically realistic standard space. Available reference brains, however, are restricted to the macroscopic scale and do not provide information on the functionally important microscopic dimension. We created an ultrahigh-resolution three-dimensional (3D) model of a human brain at nearly cellular resolution of 20 micrometers, based on the reconstruction of 7404 histological sections. “BigBrain” is a free, publicly available tool that provides considerable neuroanatomical insight into the human brain, thereby allowing the extraction of microscopic data for modeling and simulation. BigBrain enables testing of hypotheses on optimal path lengths between interconnected cortical regions or on spatial organization of genetic patterning, redefining the traditional neuroanatomy maps such as those of Brodmann and von Economo. Alan Evans is James McGill Professor of Neurology, Psychiatry and Biomedical Engineering at McGill University. His research interests include multi-modal brain imaging with PET and MRI, structural network modeling and large-scale brain databasing. He has published 400+ peer-reviewed papers and has held numerous leadership roles, most notably as director of the McConnell Brain Imaging Centre (BIC) during the 1990’s. 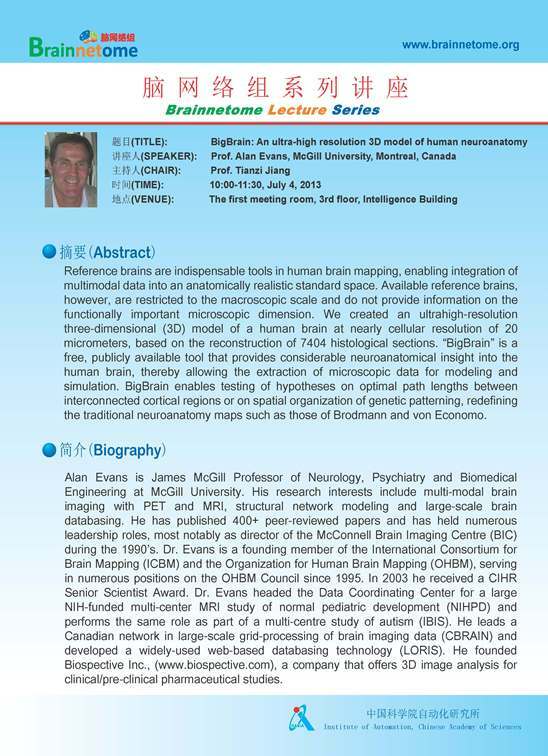 Dr. Evans is a founding member of the International Consortium for Brain Mapping (ICBM) and the Organization for Human Brain Mapping (OHBM), serving in numerous positions on the OHBM Council since 1995. In 2003 he received a CIHR Senior Scientist Award. Dr. Evans headed the Data Coordinating Center for a large NIH-funded multi-center MRI study of normal pediatric development (NIHPD) and performs the same role as part of a multi-centre study of autism (IBIS). He leads a Canadian network in large-scale grid-processing of brain imaging data (CBRAIN) and developed a widely-used web-based databasing technology (LORIS). He founded Biospective Inc., (www.biospective.com), a company that offers 3D image analysis for clinical/pre-clinical pharmaceutical studies.